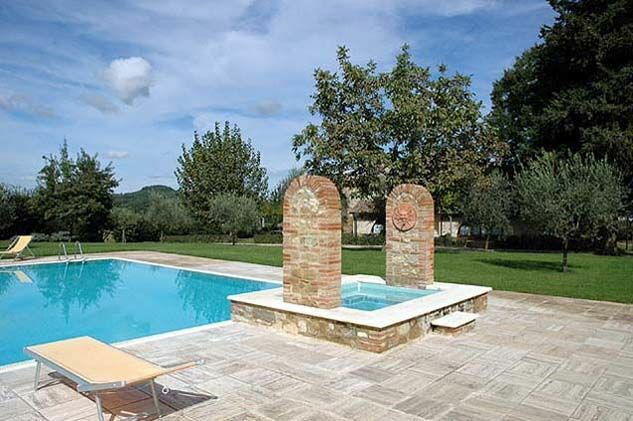 A luxury holiday in a villa rental in Tuscany. Beautiful complex originated from a fortified hamlet of farmhouses, situated in quiet and panoramic location amidst the hills surrounding Casole D’Elsa. The estate, affording nice extensive views, comprises some stone buildings, all of which have been recently restored preserving their original architectural features and turned into 15 spacious apartments and 3 one-bedroom units offering a luxury holiday villa rental with tastefully decorated interiors in a typical Tuscany manner. Distances: the small town of Casole D’Elsa whose origins date back to the Medieval period 2 km (the centre of Casole with all kinds of shops is also accessible on foot via an ancient path of approx. 800 m), Colle Val D’Elsa 8 km, San Gimignano and Volterra approx. 20 km, Siena 30 km, Florence approx. 50 km. At guests’ disposal: large furnished garden, swimming pool (10 x 20 m – maximum depth 1,4 m – open from 01/05 to 30/09) with Jacuzzi area, small fitness area, playground for children, table tennis, bread-oven, shared barbecue. On request it is also possible to reserve relaxing massages. A nice restaurant offering excellent wines and recipes of the Tuscany local tradition is circa 300 m away. Shared washing-machine and iron. Parking within the grounds. The access to the property is via an unpaved but well-maintained road. Small pets are allowed. Extra services: extra bed and baby bed available on request (payment on the spot). Maid service available by arrangement (to be paid locally). 61 m2. Apartment situated in a former barn. Ground floor: living-room (satellite TV) with double sofa-bed, dining area and kitchen corner (freezer, microwave, toaster, dishwasher), twin-bedded room, bathroom with shower (hairdryer). 1st floor: double bedroom, bathroom with shower. Private furnished outdoor area. Additional costs paid on site: Security deposit: € 150,-Final cleaning: € 70,-Heating: according to consumption.